Serene has user, role and rights management built in. This feature is not embedded in Serenity itself. 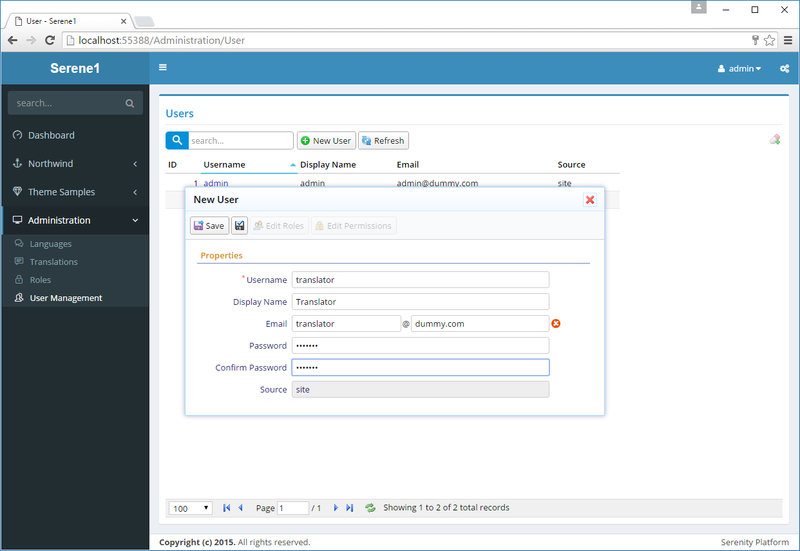 It is just a sample, so you can always implement and use your user management of choice. We&apos;ll take a look at how in following chapters. Open Administration / Roles to create roles Administrators and Translators. Click New Role and and type Administrators, then click Save. 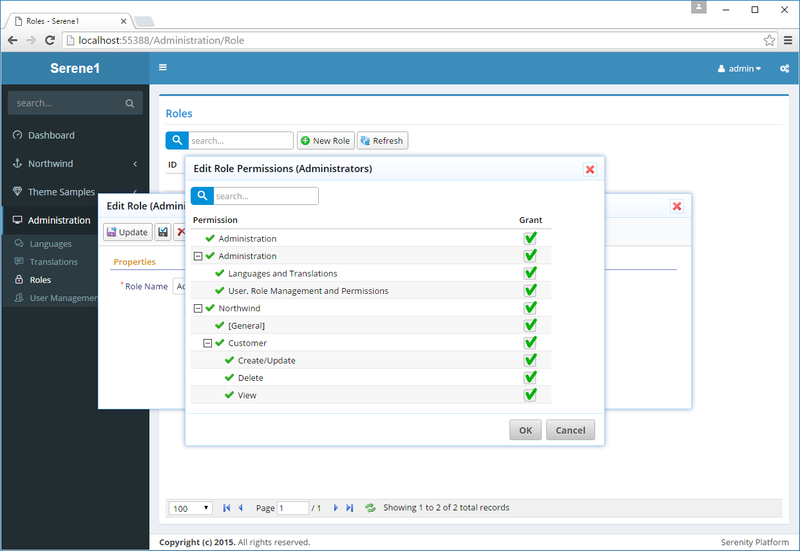 Then click role Administrators to open edit form, and click Edit Permissons button to modify its permissions. Check all boxes to grant every permisson to this role, then click OK.
Repeat same steps for the Translations role but this time grant only the Administration: Languages and Translations permission. Navigate to Administration / User Management page to add more users. Click admin user to edit its details. Here you can change admin details like username, display name, email. You can also change its password (which is serenity by default) by typing into Password and Confirm Password inputs and clicking Update. You can also delete it but this would make your site unusable as you wouldn&apos;t be able to login. admin is a special user in Serene, as it has all permissions even if none is explicitly granted to him. Lets create another one and grant roles / permissions to it. Close this dialog, click new user and type translator as username. Fill in other fields as you&apos;d like, then click Update. You may have noticed there is a Apply Changes button with a black disk icon without title, next to Save. Unlike Save, when you use it, the form stays open, so you can see how your record looks like after saving, also you can edit roles and permissions before closing the form. Now click Translator role to open its edit form and click Edit Roles. Grant him Translators role and click OK. When you grant a role to a user, he gets all permissions granted to the role automatically. By clicking Edit Permissions and you can also grant extra permissions explicitly. You can also revoke a role permission from a user explicitly. Now close all dialogs and logout by clicking admin on top right of site and clicking Logout. Try logging in with translator and the password you set. Translator user will only have access to Dashboard, Theme Samples, Languages and Translations pages.